So far we've heard the sound of the Mercedes-AMG GT, but we haven't had full details on the engine. Now we do. Meet the M178, a 4.0-turbo V8 that has at least 510 horsepower and will be in everything AMG touches. And yes, that should include Aston Martins. The M178 is part of the downsizing and turbocharging trend that has conquered the industry in the last few years. AMG has gone from a glorious 6.2 liter V8 down to a 5.5 liter turbo V8, and now the size has fallen down to 4.0 liters. But that doesn't mean there is an appreciable loss of power. 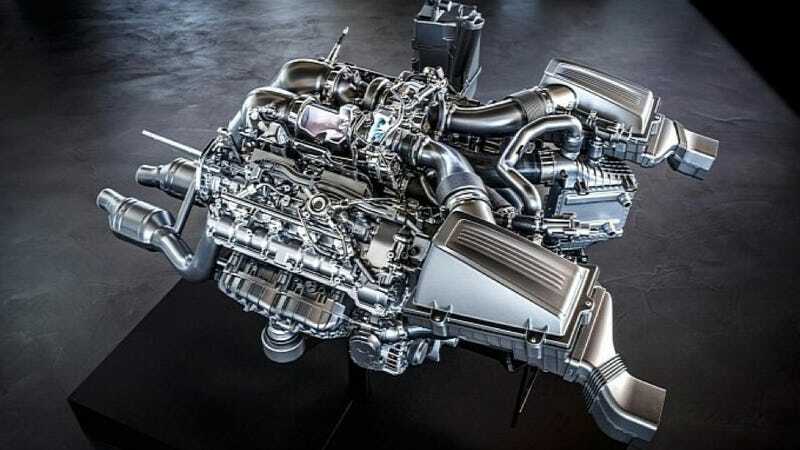 The layout of the AMG V8 is also broadly similar to that of the BMW and Audi engines, with turbos contained within the cylinder banks. That should equal quick response and minimal turbo lag. Like the 6.2 that came before (and is still in the C63 AMG), the 4.0 will make at least 510 horsepower and 479 pound feet of torque. Those numbers are almost exactly the same as the 6.2 in the Edition 507 C63. The displacement shouldn't really come as a shock, either. Audi uses a 4.0 V8 in a number of high performance models like the S8 and RS7, getting as much as 560 horsepower out of the mill. Look for AMG to change that power output depending on the application. And those applications will be a large range. Initially, we'll see the M178 in the Mercedes-AMG GT and the next C-Class AMG (Maybe they'll call it a C40 AMG and not lie about displacement in the name? I can dream, right?). But this should also be the first engine that finds a home under the hood of an Aston Martin, following their recent technical alliance. The key for Aston will be the character of the engine. If this makes it under the hood of a V8 Vantage-style car, it better sound like an Aston, which is to say, it needs to be both guttural and elegant, loud and smooth, throaty and raspy. It needs to be quintessentially British sounding. Let's see if they make it happen.